With the addition of a new children’s hospital, Vidant was dedicated to finding a better way to provide a pleasant experience during a child’s visit to the medical center. As part of the new James and Connie Maynard Children’s Hospital, Vidant envisioned four diversion rooms with the goal of reducing anxiety. 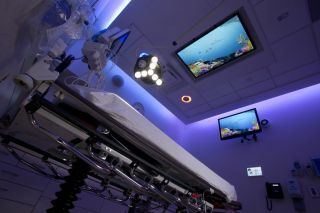 With both the child and family in mind, Vidant looked to KONTEK systems for a sensory-driven solution of lights, sound, and visuals to successfully defuse the anxiety of children and appease the worry of their families. KONTEK created four diversion room experience with synchronized video content, 360-degree lighting and audio. Requiring reliable hardware that can easily integrate with third-party touch panels, KONTEK installed SpinetiX HMP200 players as the source for the four videos at the heart of the diversion experience: a spaceship launch, an undersea theme, and two sand art paintings. The technology transforms the intimidating space into a dynamic, engaging, and imagination-filled atmosphere for the child. The SpinetiX platform easily integrated with third-party devices through API features giving both staff and patients a simple interface to control the solution. The ability to play, pause, and stop the video with in-room touch panels allowed the solution to adhere to medical guidelines, letting all interface points to be cleaned via antiseptic. Known for its reliability, SpinetiX HMP players insured not only maximum uptime but also minimum upkeep. In addition to creating a pleasant experience for young patients and their families, these sensory-rich diversion rooms have proved to be multi-functional. “The diversion room solution is very versatile,” says Leah Wilson, a Child Life Specialist at the children’s hospital. “I often use the aquarium to play ‘I Spy’ with the kids…’I spy a blue fish, where’s the blue fish?” Susan adds in, “I think they (KONTEK) delivered a solution with attention to all the difference details, all different sense.” So successful were these diversion rooms that Vidant plans to continue the concept into the new six-floor cancer center and bed tower for patients of all ages.